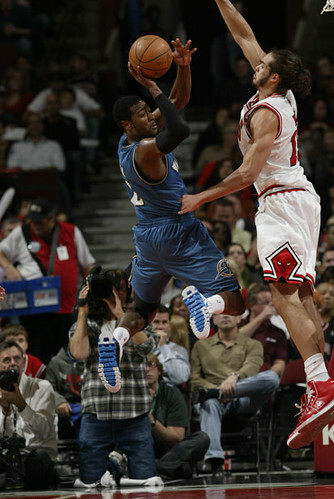 Derrick Rose, the 2008 No. 1 overall draft pick, outplayed the 2010 No. 1 overall draft pick John Wall in front of their college coach, John Calipari. Kirk Hinrich was unable to contain Luol Deng in a curious defensive matchup, Joakim Noah and rookie Omer Asik formed a nice pair of defensive skyscrapers working together, and the Bulls got their first win of the preseason Friday, 107-96 over the Washington Wizards. “Well, a win is much better than a loss,” mused Bulls coach Tom Thibodeau with his first ever head coaching NBA victory, even if it meant little. 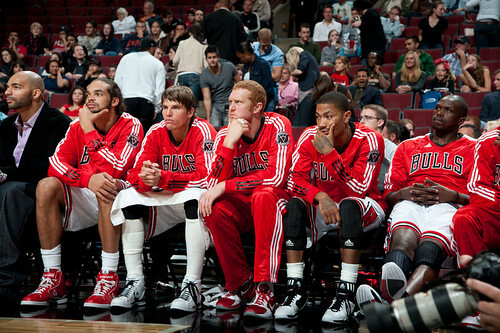 But it did mean something as the Bulls continued to find out a few more things about their developing Boozer-less team. 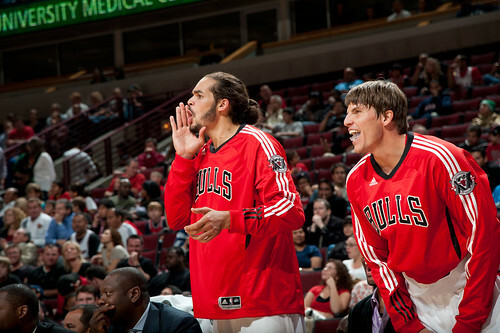 They cleaned up the boards, outrebounding the Wizards 48-32 with Noah getting 11 and Asik 10. They played together for about 10 minutes and were effective blocking off the Wizards. 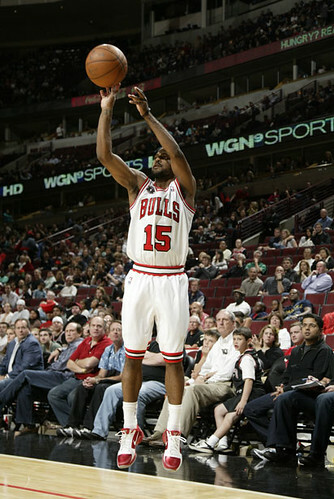 But the guy who was a man, predictably, was Rose, who had 18 points, five assists, five rebounds and two steals. And while he downplayed any competition with the latest hot point guard, Wall, Rose gave a little bit of an introduction to the NBA, especially to open the second half. Rose’s matchups with Wall, Tyreke Evans, Rajon Rondo and the veterans of the day, Chris Paul and Deron Williams are going to be some of the best stuff in the NBA for years to come. The Bulls were leading 60-50 at halftime when Rose blew by Wall and dropped in a floater, a shot the equally quick Wall is trying to develop. 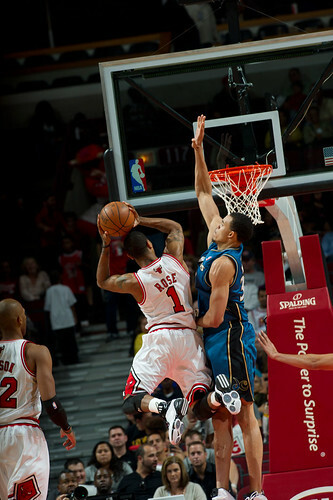 Rose then hit a 22 footer, and seemed to draw Wall into a matchup as Wall went hard left past Rose and scored, and then Rose scooped in a beauty driving hard to his left as the Bulls began to pull away and took a 72-56 lead three minutes into the second half. “He got real aggressive to start the third and I thought that set the tone for the second half and we were able to play from a lead,” said Thibodeau. But Rose was having none of any competition as he talked at length with Calipari after the game. The Bulls did that after a pretty good effort in Dallas Thursday when the Mavs went back to their starters to close against the Bulls deep bench players and pulled away. Everything generally looks better when you win, and this was a fairly complete effort as the Wizards led for about a minute, the Bulls shot 52.7 percent (an astounding for them 57 percent on threes) and had a good 28 assists on 39 field goals. They did commit 24 turnovers, five by Asik, who did get the ball stripped. But the rookie center from Turkey fought well on the boards, leading everyone with six offensive rebounds, and was able to finish athletically at the basket with lob dunks. 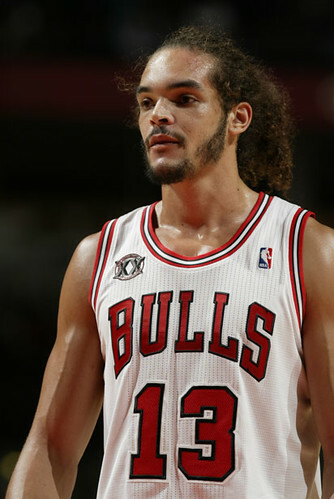 He will have foul trouble, but he outdid his Washington counterpart, JaVale McGee. It was a solid performance for a third game in the NBA with Asik slamming on a nice pick and roll catch late in the game and getting a pair of offensive rebounds late over Kevin Seraphin, the draft pick the Wizards got in the Hinrich trade. I thought that also was partly due to Thibodeau’s defensive system, which the players seem to be picking up quickly. Thibodeau has different coverages depending on position and it seemed to disrupt the Wizards, though the Bulls did sink in a bit and leave a few too many easy perimeter looks with the Wizards hitting 11 threes. Kyle Korver again was impressive with 17 points on seven of 12 shooting and answered every Washington run in the second quarter when Korver had 14 points and the Bulls stretched out to a double figure lead and kept it all second half. 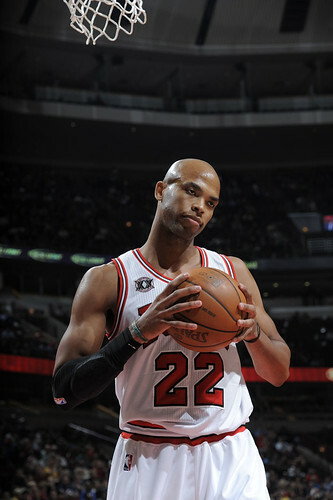 Keith Bogans again shot the ball well, making three of four three pointers, and James Johnson looked more lively with seven points and five assists, one score a spectacular drive in which he soared and it appeared his head was over the rim, though he just floated the ball in. One issue I have with his game is he doesn’t seem to like finishing strong and even when at the basket tends to flip the ball. The Bulls also got another good effort from free agent Kyle Weaver, who ran the offense well at point guard and had five points with a three, five assists and four rebounds. Hinrich, making his first return to the United Center, got warm ovation when he was introduced and then found himself engaged in a matchup with the much taller Deng to open the game. Hinrich missed the Wizards’ first shot, and Deng took off with Rose and with no one covering back for Hinrich, Deng got a fast break dunk. The Bulls then went to Deng to try to postup the smaller Hinrich, but Hinrich drew a turnover with the old “pulling the chair out” trick, though Deng then forced Hinrich into a turnover with backcourt pressure. 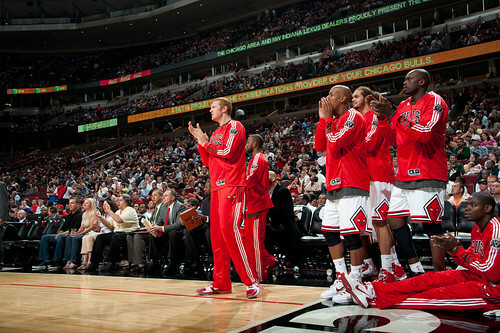 The Bulls soon went away from that strategy as it had them standing around too much. 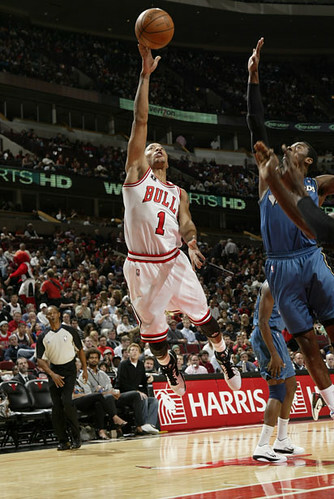 Thibodeau said he liked getting more postups for Deng, but probably should have done it out of more movement. 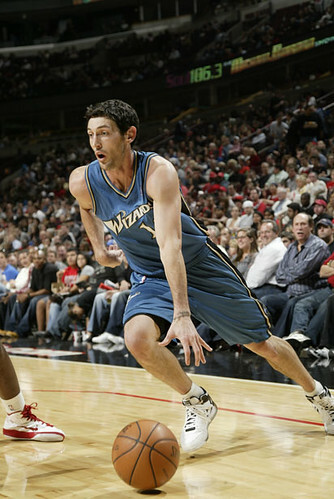 The Wizards got a big boost early from Gilbert Arenas, who had 16 points, 10 in the first quarter with a pair of threes. Arenas is coming back from his suspension for gun violations and taking a bit of a back seat to Wall, playing more as a two guard shooter. Wall does draw a lot of attention and did finish with a game high six assists. 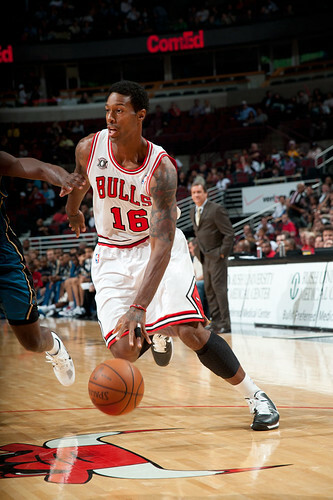 The Bulls also got burned from outside by Nick Young, but mostly late as Young ended with a team high 18. It was 29-29 after one as the improving Yi Jianlian hit a pair of jumpers, though Hinrich only ended with four points on one of five shooting. 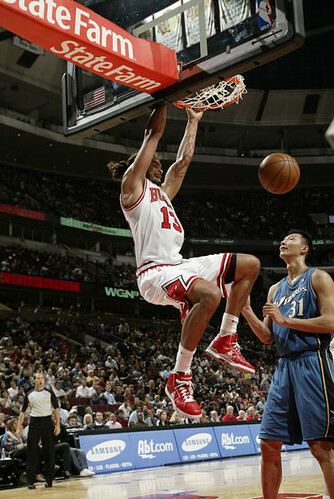 Weaver and Korver carried the Bulls into halftime, and then Rose carried them out and the Bulls coasted to the win.